Is "Argo" a True Story? Lee P. Ruddin is Roundup editor at HNN. He lives in England. Ben Affleck is receiving well-earned praise for directing (if less so for acting in) the movie Argo. Set in an authentically recreated 1979, Chris Terrio’s script (heavily based upon Joshuah Bearman’s 2007 Wired article) tells the dramatic, declassified true story of how Central Intelligence Agency (CIA) “exfiltrator” Tony Mendez (Affleck) extracted six fugitive American consular employees out of Shah-toppled, revolutionary Iran. Hollywood critics are currently falling over themselves to congratulate Affleck on his third feature as director and some (The Hollywood Reporter, Huffington Post, the Los Angeles Times, to name but three) have even gone as far as to suggest the Academy Award-winner (awarded for Best Screenplay and shared with Matt Damon, co-writer of Good Will Hunting) make room on his mantelpiece for another gong. Even if we know that historically it all ended well, Affleck’s direction and the tight editing set an uneasy mood and up[ped] the pressure considerably, ensuring the final act is as tense as anything this year’s thrillers have produced. The film’s first few minutes are a shining example of Affleck’s entire approach toward presenting the dense chronology and context of the events that precede the hostage crisis. Using storyboards, archive footage of the events and a rare voiceover, Argo’s opening sequence is a delicate balancing act of sharing historical facts with the viewer while very subtly pointing to the role of the film in the story. While the historical prologue does contextualise political events to a certain degree for, say, cinema-goers not well versed in Middle Eastern affairs, the unnuanced preface illuminates the fact that Affleck dropped out of college and is an individual whom should have continued his studies in Middle Eastern affairs or, better still, enroled on an Anglo-American relations course. The reason I say this is because it is simply not good enough to provide a brief – very, very brief – 2,000-year history of Iran and simplistically suggest that a CIA-engineered coup in 1953 (which overthrew the democratically-elected Muhammad Mossadegh and reinstalled the Shah) led to the Iranian hostage crisis 26 years later. This said, many will agree with Robbie Collin (Daily Telegraph) that Affleck’s prologue is a ‘responsible touch.’ And many more will agree with Andre Rivas (Fully Operational) that ‘this is the part of the movie anti-intellectual extremists like Rush Limbaugh would have left on the cutting room floor.’ Having studied Middle Eastern affairs as well as Anglo-American relations, however, I believe that Affleck’s (ostensible) intellectualism is irresponsible since it overlooks Britain’s role in the run-up to the Islamists’ seizure of the United States’ Embassy – something which could, indeed should, have been included before artistic licence took hold in what is nothing if not a fantastic flick about a fantastic fake flick and how Tinseltown affected events on the ground in Tehran. Before looking at the hostage crisis, though, let us first deal with the 1953 coup, albeit momentarily. Affleck is of the belief that the CIA was the prime mover 59 years ago but as Mark Curtis, author of Secret Affairs: Britain’s Collusion with Radical Islam, informs readers, ‘Britain was in fact the initial instigator and provided considerable resources to the operation’ [my emphasis]. I am surprised Affleck is unaware that this was a British-led revenge plot since President Obama (an individual for whom he has actively campaigned and voted for twice) hardly took full responsibility in Cairo in 2009, merely conceding that his nation ‘played a role’ in overthrowing the nationalist leader. “Two wrongs,” they say, “do not make a right,” and “ratting” – to use political parlance – on the Shah after reinstalling him upon the Peacock Throne was a cynical act with dire consequences. Britain’s weak support for the incumbent provoked the opposition to act and thus put American lives in grave danger; the phrase “weakness is provocative” is one Britain’s Ambassador to Iran, Anthony Parsons, should have been cognizant of before the Foreign Office removed its support for a regime it had reinstalled after cajoling America’s warlike Rome with its Grecian-like experience into becoming its trigger man. To add insult to injury, Affleck informs viewers (or, more precisely, the Deputy Director of the CIA informs Affleck’s character) that the British Embassy ‘turned … away’ six State Department officials in their hour of need. Post-revolutionary Iran famously refers to America as the “Great Satan” and those at State would have good reason, should the aforementioned devil-ish act occurred, to apply a similar derogatory epithet to Great Britain. 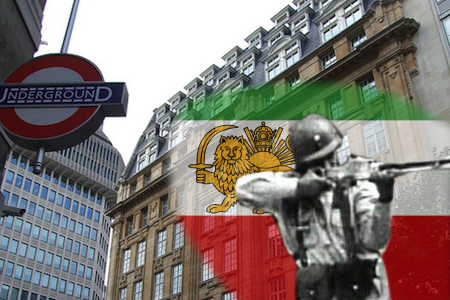 Suffice it to say, however, Britain opened the doors of its summer compound in northern Tehran and helped the group’s passage to safety. A recent event, such as the United Kingdom’s High Court blocking (on a legal technicality) the extradition to the U.S. of a former Iranian Ambassador, though, arguably allows the latter to apply – for want of a better epithet – “Little Satan” to the former. I say this since both the Home and Foreign Offices sought to persuade the Department of Homeland Security and the Attorney General that they should withdraw extradition proceedings against Nosratollah Tajik (a target of a sting operation charged with arms dealing) on the grounds that it could damage Britain’s bilateral relationship with Iran and endanger the safety of British Embassy staff in Tehran. Not even Affleck could have made this ironic twist up.